The Perfect Gift Idea for Dad! Chesapeake Bay Golf Club’s 2018 Golf Pass card features a variety of big golf deals and value added extras – all at a sweet price back for a limited time to kick off the 2018 golf season. This is the Golf Deal you’ve been waiting for! Print Coupon and Show it at the Pro Shop – or Buy Online below today! Hurry! 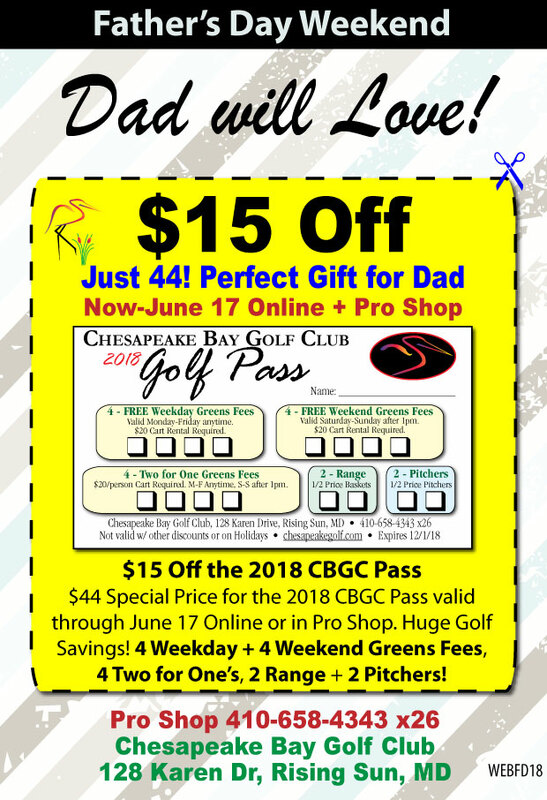 Father’s Day $15 Off CBGC Golf Pass Special valid Now-Sunday, June 17, 2018. Big Deal! Price just $59 $44 per pass. Select Quantity in the shopping cart – Buy 1, 2 or more! CBGC Golf Pass is transferable! Use for yourself and share with a friend. Chesapeake Bay Golf Club is not responsible for lost or stolen cards. Powered by Victory Golf Management LLC. This will be noted on your online receipt.